We hope this note finds you doing well. In the upcoming weeks you will notice a subtle change in the Vital Essentials frozen patties. We have recently installed a patty machine that will allow us to remove the band saws, which for many years have been used to create 8 ounce portioned patties. These saws were extremely dangerous and were a major employee safety concern in our production operation. Fortunately we have not had an injury related to the operation of band saws…and we are glad to say…with the arrival of our new machine…we have eliminated any risk of band saw injury in the future. 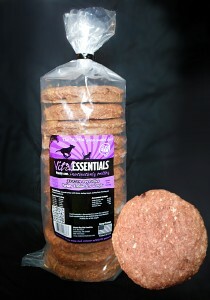 Vital Essentials patties will remain at 8 ounces…and will retain a round/circular shape. Product and packaging specifications, along with product codes, will remain the same. Please see the attached photos to familiarize yourself, your team and your customers with the change. It is likely that you may begin receiving these patties on orders arriving the week of November 19th. Please share this news with your associates and with retail clients. Please contact us if you have any questions @ 1-800-743-0322. Find Vital Essentials at a Solid Gold Northland Retailer near you.